Within the Field of photographing movement there have been figures that have stood out from the crowd. Although from the elite few there are such names as Eadweard Muybridge, Etienne-Jules Marey, Thomas Eakins, and the Lumiere brothers (Auguste and Louis). From these four the two people that are easily recognised are Eadweard Muybridge and Etienne-Jules Marey. Eadweard Muybridge was born on April 9th 1830, Eadweard himself was actually baptised as Edward James Muggeridge at all saints church Kingston. He later changed his surname to Muygridge then to Muybridge. He also spelt his Christian name as Eadweard. The Anglo-Saxon kings often spelt there name this way it has been said that Muybridge may have seen it spelt this way in the coronation stone which had been inaugurated at Kingston in 1850. Muybridge left England sometime prior to 1856 though the exact date is not known. He then made his way to America to become a bookseller, and publishers agent in San Francisco, at this time he traded under EJ Mugridge. Reverting to the second spelling of his name. During his stay in America he was badly injured in a coach crash in 1860 whilst travelling overland from San Francisco to New York for a trip back to Europe. He then spent the next six years in Europe whilst recovering from the coach crash that had caused a serious injury to his head. In 1866 he returned to America to become a photographer in earnest. At this time the process that was being used was called wet collodian process, this involved the treating of glass plates with certain chemicals to produce a negative. This in turn meant that all materials had to be carried into the field. Muybridge called his mobile darkroom The Flying Studio usually a horse drawn covered cart Though when in mountainous county this could revert to using a mule train and a tent to suffice. Commissions leading him as far a filed as Alaska in 1868 and Central America in 1875. Sometimes this would be for the government as the official photographer. Two of the most noted works are the final stages of the conflict between the Modoc Indians and the United States army (See below). It is said that even by todays standards his work is remarkable in details and dramatic effect. Though it has to be said that Muybridge most famous and remarkable work is the flying horse. He first became involved in this field in 1872 when Leland Stanford Former governor of California asked him to photograph his horse Occident. There was an argument at this time in horse circle whether or not a horse ever has all four feet off the ground at the same time. The first attempt was made in Sacramento , although the results did show that at certain stages a trotting horse did indeed have all four feet off the ground at the same time they are little more than silhouettes. Although in 1878 -1879 there was a more elaborate experiment at Palo Alto . Here they placed a line of cameras in a long shed in front of each was a specially constructed shutter which was electro magnetically trigger by the horse or a sulky that made contact the wires that had been carefully stretched across the track. This method was successful in photographing movement for the very first time. The results of this experiment were published in Muybridge work entitled attitudes of animals in motion. The prints were mostly of horses though human athletes as well as other animals were used to show the works of Muybridge. This was highly praised in both America and Europe by scientists and public alike. Muybridge also invented the zoopraxiscope. This in order to create moving images from stills . Once Muybridge had developed his zoopraxiscope it was first used in Stanfords home in 1879 and subsequently in Muybridges lectures. Muybridge travelled to Europe and lectured before distinguished audiences in Paris in 1881 and London in 1882 thus being granted $5000 by the University of Pennsylvania working along side Thomas Eakins, to further his research. During 1884-1885 Muybridge took more than 30,000 photographs of men, women, children, animals and birds in all conceivable types of movement. He was able to take advantage of the new gelatine dry plate technology available to photographers, these produced clearer images and also tonal definition (See right). Also enabling short shutter times to be used. Muybridge then added a motor clock device which enabled him to take three different views of the same scene all at the same time. This involved three cameras each with a total of thirteen lenses one for viewing and twelve for taking images. During this time Eakins was able to devise a single lens camera with a movable plate with the help of Muybridge so he could capture sequential images of athletes running. The results of this application were published in a monumental work entitled animal locomotion published in 1887. Containing 781 folio sized prints. The intention Muybridge had was to create a visual dictionary of human and animal movement for photographers and artists alike. This is still to this day considered the most comprehensive study of movement ever undertaken, and is still widely used today as a source of reference and illustration to photographers and students alike. Muybridge died 8th May 1904; in his will he bequeathed his zoopraxiscope and a large collection of slides to the Kingston museum. The other person throughout history widely recognised in this field is Etienne-Jules Marey. 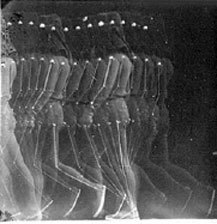 Whereas Muybridge used several cameras Marey only used one to study movement the movements being recorded on a single photographic plate. Characteristics of his works were that the subjects wore black suits with metal stripes or white lines as they passed in front of the black backdrops. It is a common misconception that slow motion photography is new yet Marey invented a slow motion camera in 1894 which took pictures at a rate of 700 frames a second. Amongst the invention from Marey that have helped photography to evolve through the years is the sphygmograph an instrument for graphically recording the features of the pulse and variations in blood pressure. The basic instrument is still in use today with modern modifications. During his works Marey also contributed to the development of motion picture. After this time in 1882 he managed to invent a camera with magazine plates that recorded a series of photographs, in 1894 he adapted this to become the modern microscope. But Mareys greatest achievement was the use of photography to study movement. His chronophotograph (multiple exposures on a single glass plate and also strips of film that passed through a camera of his own design) had a major impact on the arts and scientific community alike. After this accomplishment he was made the president of the French photographic society, for many years. In the early 1880s he published a series of pictures of birds in flight using his photographic gun a forerunner of the motion camera it had a sight and a clock mechanism and made 12 exposures of 1/72 th of a second each. He used this to show the changes in birds wings during flight in relation to wind resistance. This lead to an interest in aerodynamics generally and in the 1890s he built a small wind tunnel and produced the first photographs to depict turbulence and to determine which shapes produce less resistance using the photographic gun and methods. With the photography of movement Marey as well as Muybridge found problems and had to invent or adapt current equipment to the task. Marey found that anything moving left a blur on the silver plate. Marey invented a method using a fixed photographic plate and a rotating slotted-disk shutter, this enabled him to make multiple exposures on a single plate and to reduce blur. Although this did not eliminate blur. This was solved eventually by choosing the lines that show the best definition of a subject, thus making the offers redundant. Marey died may 15th 1904. So Muybridge and Marey employed different techniques yet they both advanced the photography of movement a great deal with the efforts that are written here. Ranging from black suits with silver stripes to catch the light. Through to a collection of cameras strategically placed to trip as an object passes. Surely with the work they have endured they are some of the best photographic minds to have lived?